Student must carry his/her almanac to school daily. All identity information should be complete and duly signed by parents. The students should come to school in time. Late corners should report to the PTI on arrival. The school does not hold itself responsible for injuries sustained by Pupils while in school. However, first aid will be rendered immediately without delay. The students should be proud of their school uniform. They should be clean and neatly dressed. Attendance in the morning assembly is compulsory. During birthdays, students are not permitted to distribute sweets among the students. The students are not permitted to bring objectional books, magazines or such literature to School. Radio, video game, mobile phones, pagers and other electronic gadgets are not permitted in school. Expensive watches, ornaments/valuables or jewellary are also not permitted. Irregular attendance, neglect of homework, insubordination with teachers, wilful disobedience or behaviour not in tune with the general discipline of the school, will be dealt with seriously. be proud of their school and present a good image especially by behaving themselves when in public. greet their teachers whenever they meet them and never speak ill of them. Speak English within the classrooms and school premises. be regular in attending classes and doing their homework and other assignments. keep off verandas, staircases and classrooms during recess/lunch breaks. 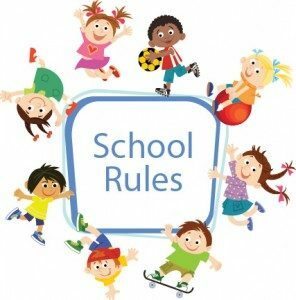 The Principal reserves the right to suspend/rusticate or take disciplinary action against a student who violates the school rules/indulges in any form of indiscipline or whose conduct is harmful to other students.